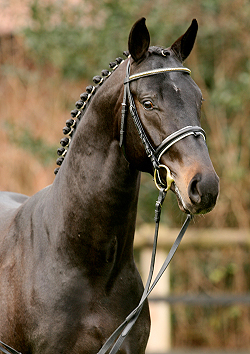 Rosandro, brown Hanoverian Stallion, by (Rosario / Rubinstein I) born in 2004, standing approximately 16.2 hands. Rosandro was licensed in Vechta 2006. 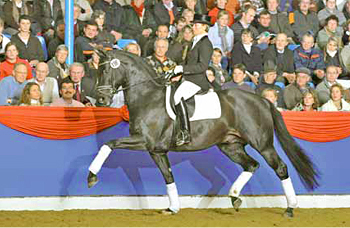 He was by far an outstanding, supple mover and certainly deserved a premium rating, however, he is branded Hanoverian, and Premium awards are reserved for Oldenburg sons only. 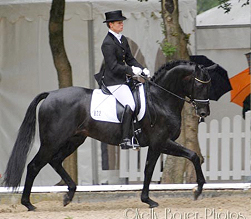 Under Kira Wulferding he had several series victories with maximum notes in riding horse and Dressurpferdeprüfungen. His 30-Day-Test in 2007 in Schlieckau also resulted in high scores. 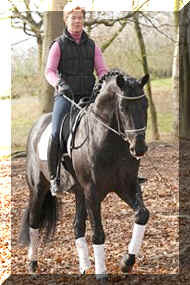 With a dressage score of 8,69, (2nd place) and final total score of 8,21, he came out third place.. The mother of ROSANDRO Saniza is by SANDRO HIT, who has produced over 100 licensed sons so far, with numerous Champion stallions; nine federal champions, 84 States Premium daughters and successful sport horses, like the Salieri OLD/Victoria max Theurer/AUT victorious in World Cup dressage classes . Rosandro’s grandmother Eniza produced the “S” jumper Hidalgo (v. Waldsee) and the M level dressage horse, Latino (v. Landor S). Rosandro is already an accomplished competition horse; winning and placing in his first tests for young riding and dressage horses and especially at his 30-day test in Schlieckau. He received a score of "very good" for his trot (9.25) and for rideability (9.0). He also had high scores for his walk (8.88) and character and temperament (8.75). Jumping was awarded a score of 7.00 and with a weighted total score of 8.21 he ranked third in the group of 32 competitors at the test. With a final score of 8.69 with emphasis on dressage, he finished second. Under the careful training of Kira Wulferding/GER, Rosandro will be given sufficient time to mature. 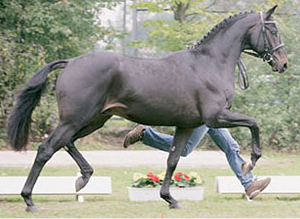 Just like Fackeltanz and Sternenfänger, Rosandro is available for breeding, although only for a limited number of breeders.